I am serious about my religion. I don’t take its sacraments lightly. A long walk, a trusted companion, an open fire. I cannot imagine a relic, a book, or a doctrine more sacred. We previously reflected upon the intimate, multifaceted relationship between ancient man and fire, and considered how easy it would have been for a man such as Heraclitus to conceive of the idea that fire is the fundamental constituent of all matter. Heraclitus was, after all, a subject of the Persian Empire, a land of fire worship, and the reputed cradle of alchemy. Alchemy is a practice of transmuting matter that depends greatly upon fire. It seems to be a natural—albeit mystical—offspring of the bronze age. fire is hunger and satiety. Fire is indeed a hungry phenomenon. It seems to exist exclusively to consume, though the light and heat it has provided us through the millennia make it much more than a consumer. Yet it remains an archetype of consumption. Is not combustion the primal hunger within us? Is it not our deepest physiological craving for the fuels of combustion: oxygen and carbon compounds? But fire is obviously not equal to hunger, for as consumption, it is also the satisfaction of its hunger. Seeing everything around us as governed by this paradox, one can easily see the function of fire in the philosophy of Heraclitus. Heraclitus taught that the world is governed by a harmony of opposites. Recognizing that harmony, he saw wisdom in the working of things, but it was a harmony of war, of hunger. Whatever equilibrium he could see was a dynamic, cyclic equilibrium under tension. To Heraclitus, fire must have seemed fundamental both literally and metaphorically. When God spoke to Moses, God took the form of a burning bush. The fire is in the bush from the beginning. 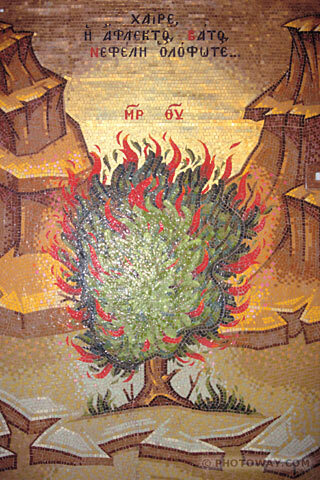 Why did an ancient Israelite think that God would take the form of a self-immolating bush? It might be natural enough to think that fire consumes a bush, but there’s another way to see it—the way that many ancients saw it: the fire is in the bush from the beginning. It’s not really such a crazy idea if one considers that the fire cannot occur without what’s in the bush. Sure, the fire also needs oxygen, but again: the bush exhales oxygen as it generates wood and foliage. It provides the fire with everything it needs. It is, in a real sense, a terrestrial offspring of the sun, waiting to ignite. With the igneous nature of vegetation in mind, consider the igneous nature of the earth. Volcanoes could not have escaped the awareness of the ancients. With accompanying seismic activity, it must have been easy to conclude that the earth itself has a fiery cauldron at its heart. Gas and oil seeps, when ignited, may have lent some corroboration to this conclusion. Indeed, it is well-known that a fire temple recently made use of the natural gas seeps at Baku, Azerbaijan. The Baku fire temple, depicted in a 1919 postage stamp. It is easy to underestimate the value of fire to ancient peoples. Fire gave them an ability to function at night. Fire defended men from large predators. Fire was a weapon of war, a companion in the hunt, and a tool for managing vegetation. But more remarkably, fire seemed capable of transforming things. Fire tenderized and flavored food. Fire sterilized flesh and purified water. Fire evaporated water. Fire transformed clay to pottery. When iron was placed in fire, the iron itself would take on the the color and heat of fire, and suddenly man could reshape matter. But fire got even more amazing with the advent of the bronze age. Fire had previously been used to forge iron and transform flesh. Now it would be used to transform matter itself. Alchemy would naturally follow. Ancient peoples must have felt a tremendous sense of awe when witnessing the transformative power of fire. It had long been our companion as a species, to be sure, and it had also remained an untamed force of nature. Whether embodied as the sun, the thunderbolt, or a metalworker’s forge, it is a god who holds a special place in his heart for humanity. No wonder, then, that the Persians worshiped it. No wonder they associated fire with the very ordering principle of the universe. No wonder that Heraclitus—an Ephesian subject of the Persian Empire—did the same. Fire seemed capable of transform anything. This very same religion assigns its most tortuous, cruel punishment to the crime of arson. Is not such a sign of respect for the power of fire a form of worship? Today, we don’t think so much of fire, yet we, with our gas-fired power plants, furnaces, boiler rooms, and internal combustion engines, are every bit as dependent on combustion as our ancient forebears were—to say nothing of the other forms of fire. 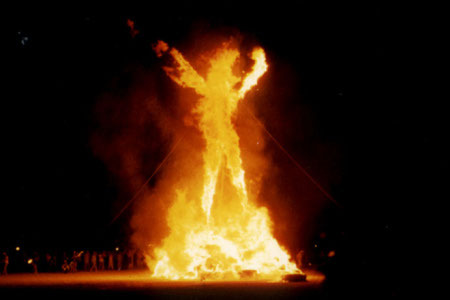 We are a civilization of fire worshipers, though our iconography has changed. What is the color of life? Green. Certainly, most observers would agree. Yet when one considers what the green represents, one might not remain so certain. Green is the color of photosynthesis. It is therefore the color of the conversion of light energy to chemical potential energy—stored energy. Fire Poppy: only appears immediately after a fire. Isn’t life better seen as the active changes in things, rather than the potential for those things to change? What life would there be if nothing ever actually changed? Life itself is in the consumption of the potential—the combustion of the products of photosynthesis. The actual life is in the burning, that is, the respiration. A fire seems alive. It respires just as we do, needing the same oxygen and exhaling the same carbon dioxide. it is that same phenomenon—combustion, in the form of cellular respiration, that gives us life as aerobic creatures. Not to take anything away from water or carbon, which to some extent all life seems to require; it’s specifically combustion that gives us life. Of course fire is a universal phenomenon of which combustion is but one example. Ultimately, it is fire that gives us the building blocks of life—elements such as oxygen and carbon; but for now let us stick with combustion. Spontaneous combustion: It happens all the time. The food that we consume is used to feed the internal combustion engine within us, just as a campfire consumes wood; just as a car’s internal combustion engine consumes petroleum. Like the life that we know, the fire grows as it consumes, and as it grows, it travels. Not only does an individual fire grow; some even bear children: they spit out fire children that rise on the parents’ convective currents and fly outward to begin lives of their own. Perhaps you have seen a fire sleep, mimicking the stars in the sky with its constellations of red coals. Or maybe you’ve watched the mesmerizing dance of a fire. Maybe you listened to its crackling song while it danced. Was it a song, or was that the sound of its infernal molars crushing its food? Did you hear it breathe? It breathes in and it breathes out. Have you ever suffocated a fire? Funny how that can seem a little like a killing. Good Thinking. “Good” is regarded in two senses: both as beneficial and as effective. Thus wisdom and goodwill are implied. This “good thinking” is the means by which men are advised by Lord Wisdom. Truth. This is Asha, the most valued principle in Zoroastrianism. Asha is symbolized by fire, probably for fire’s utility in illumination, prehistoric trials by ordeal, and in purifying metals. Asha is generally translated as “righteousness”, but seeing as Asha is generally juxtaposed against “the Lie” in the earliest sources, it probably originates more in truth rather than in obedience to a moral code. Then shall the earth become a level plain, and there shall be one manner of life and one form of government for a blessed people who shall all speak one tongue. I don’t think it’s too much of a stretch to interpret “a level plain” politically, rather than physically. Additionally, the principle of world reform need not entail notions of theocratic utopias. The point, I think, is to make a project of ridding the world of suffering. Devotion. This is generally seen in a conventional religious sense, but when we consider that this god of devotion often doubles as a Mother Earth figure, we can see that “devotion” in this usage can be seen as a loving commitment to the welfare of the world. Health. Symbolized by water. Coupled with #6 (see below). Sometimes cast as wholeness. Life. Symbolized by vegetation. Generally specified as immortality or long life. Along with #5, this is often presented as a reward to the righteous. I prefer to think of health and life as values. This is not far-fetched, considering the emphasis placed upon life in Zoroastrianism. Life is, in fact, often equated with goodness itself, opposed to the evil of death. Once the virtue of life is established, the virtue of health can hardly be doubted, but health is also a virtue of its own, for life has significantly less virtue when overcome with illness.